This Christmas gift was from a mother who has a son that studies about the Kaizen system of Continuous Improvement. It was done in the Kaisho style, which seems fitting for this word. I have just ordered the cloth to make the scroll with and will be exicted to get this finished for their Christmas present. This is the second scroll with a name on it. I love this cloth....it is a very beautiful plum color with an ivy/flower design. As a result I used a flower pattern in the Ichimonji to give a similar effect. The writing is done in a Gyousho, semi cursive style. You can see the cloth and Jikusaki upclose here. 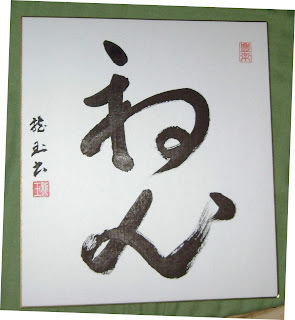 Meikyo-shisui is a very good expression to know how our mind should be. Let me explain what kanjis mean. Meikyo means "a clear mirror". It is a clean mirror so you see no dust, clouds or condensation on it. The kanji itself says, "shining mirror". So you can imagine how clean the mirror is. Shisui means "the water that is not moving", the still water. If the water is still, completely still, it can reflect anything like a mirror. So what do you think it means? So what kind of state of mind is it when it is like the really clean mirror and the still water? When a mirror is dirty or it has something on it, it does not reflect things as it should. So it is not working as it is supposed to do. When your mind is not clear, your mind does not work as it is supposed to, either. Moreover, when your mind is not clear or clean, it is usually mean that something evil thing is going on in your mind. So there are two meanings in keeping your mind as clear as a clean shining mirror. One is that your mind and head is so sharp and clear that you will not misjudge anything. Another meaning is that you do not have any evil thoughts in you. This wallscroll was ordered for a person who commissioned two scrolls for a wife's and daughter's first name. The first one is with a beautiful light pink Kireji (cloth) that is a silk. The pattern in the cloth is a faint, wispy line, so I tried to use the complementary flowing lines in the ichimonji to complement the design of the cloth. In most situations, customers do not order special Kakehimo. Hanging thread, but in this case the customer put a lot of thought and ordered the Sakura, which is a pink thread with dark fleck design. It went really well with the scroll, and makes it that much better in my opinion. The shitan (rosewood) jikusaki also provides a good dark color to contrast well with the light pink. This customer ordered a scroll specifically to display with a Suiseki. 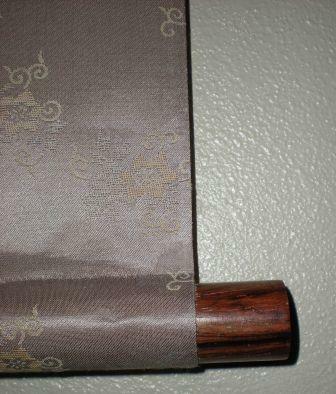 We consulted on various aspects, and they chose to do it in a Nidan Hyougu (Two Step) style of scroll. My only concern is that my display Sensei dislikes the use of darker kireji (cloths) as he says it distracts from the main Suiseki/bonsai. With that said, I think it is a pretty color combination with the gold to brown transition, giving it an earthy feel that could be matched well with the rock. 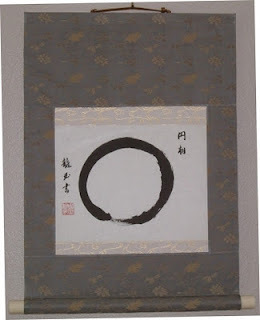 The Enso, was also selected from some my wife, Ryugyoku had drawn previously. 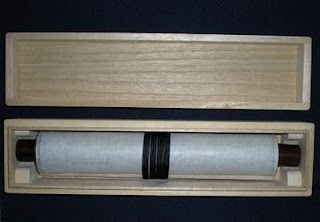 The scroll is complemented with a beautiful pair of Ebony (Kokutan) jikusaki and Kincha (Dark Gold) hanging string. These three scrolls were commissioned as gifts. It reads "Seishin Ryoku Dou". 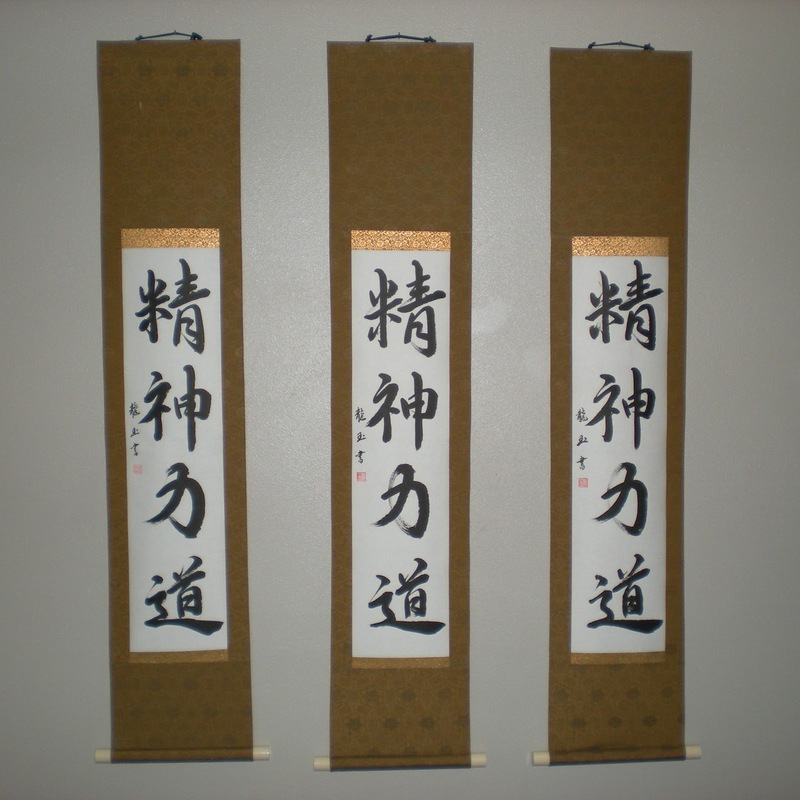 The Karateka purchasing the scrolls wanted the phrase "Way of Inner Strength" translated into Japanese. We went through several iterations, until Yoshimi decided upon using Seishin 精神, which can mean Spirit, Soul, Mind, Heart, or Intention. Those words embody everything that is internal and spiritual. The Ryoku 力 is Strength, and many people are familiar with Dou 道 as "The Way". The writing is done in a beautiful gyousho semi-cursive style, and each one is unique because they are slightly different. The cloth selected by the customer has a beautiful large blue pattern on a gold/brown background. This customer ordered with a tight deadline and I was really worried whether it would be ready or not...but the scroll was just shipped this afternoon. 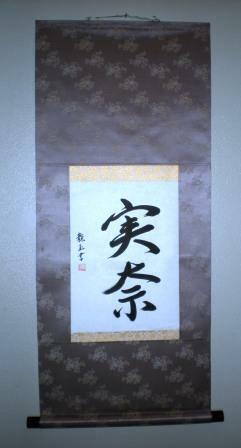 This is a long thin scroll, with the Name of the Dojo in Gyousho or Semi-cursive style Japanese Calligraphy. I think the cloth is beautiful, and that is why I took a closeup of the cloth. It is styled with a deep gold on gold karakusa Ichimonji that transitions well into the green kireji. It is completed with a black lacquer wood jikusaki and a Takuboku design kake/makihimo. Kuzuhara Sensei's critique of a display at the Toko Kazari competition held at the Clark Center for Japanese Art and Culture...The picture on the left is the original display, and the photo on the right is Kuzuhara Sensei's photoshop suggestions to improve the display. First off, the flow of the main tree and the placement of the display are opposite. In the case of using this main tree, it should be seated on the right hand side of the display, to make it a right to have it become a left flowing display. (Sashoute or Migishoute, I am not sure on the correct reading if it is considered one word or mixes on and kun yomi), because the bonsai's left hand side will create space. A tree that flows to the left should have the pot placed a little more to the right. But because it was set up to be a display on the left flowing to the right please understand what I will say from this point on. This tree is not yet a finished bonsai, and I have done a virt to show how if it were to be a finished bonsai that was a Hidari Shoute (Flowing to the right) display how I would try to style it. In the revised picture the pot, and foliage, as well as the table and accent placement provides more balance for the display. Additionally, the picture of the waterfall in the scroll follows the same pattern as the tree and is redundant to the display, and I slightly amended the picture in the scroll to try and minimize this effect. This critique is provided by Kuzuhara Hiroyuki, a Shihan rank bonsai display specialist. He wrote and sent this in Japanese, and I have translated it. The photos are from the Toko Kazari competition at the Clark Center for Japanese Art and Culture. The critique of this display. The original display is on the left and the revised display with Kuzuhara Senseis recommendations is on the right. 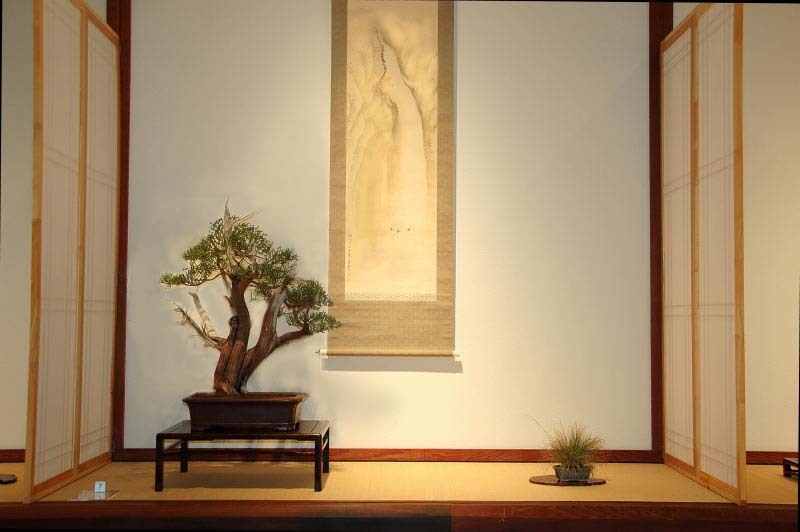 This Shohin bonsai display when looking at a first glance seems to acheive unity among all the elements, but there are a few points of mistake in the rules of display. First off, when displaying a Kengai or Hankengai as the main tree, it is good to use the tall table placed on top of this type of large jiita. However, this tree, with its thin trunk and styling would be considered more of a bunjin styling, and in this case it would be better to not use the table and place the bonsai directly on the jiita. Also, when using this type of large jiita it is a common rule if you are using an accent piece to place the accent in the upper right corner behind the tree. The second point is that the height of this kusamono is too high. I have not submitted a post for quite a while because of illness and trying to manage about 7 orders with multiple scrolls. I vended at the Golden State Bonsai Federation convention in Riverside, California. It was a very slow year for me this convention, fortunately holiday orders in other market segments were up significantly. I thought there would be quite a few custom orders, but only one came about in the end, and a few off the shelf sales. However, there was one bright spot, a custom ordered scroll was used in a formal display competition at the Clark Center for Japanese Art and Culture. 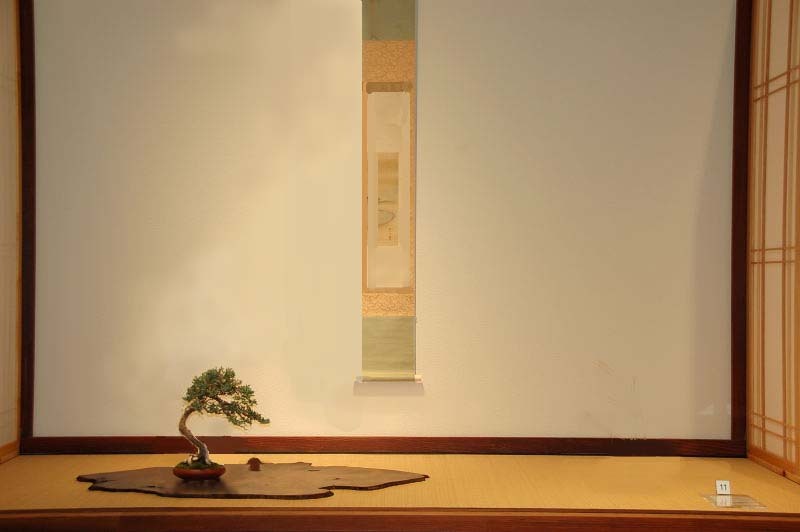 It was confirmed in a separate bonsai forum, that the person who commissioned the scroll also set up this display. This was the 3rd Annual competition. 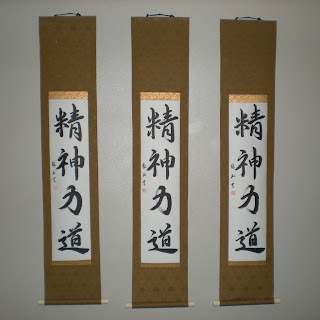 The scroll was brushed in Sousho, full cursive style writing, which is often the preferred style of calligraphy when displaying a bonsai with Calligraphy. 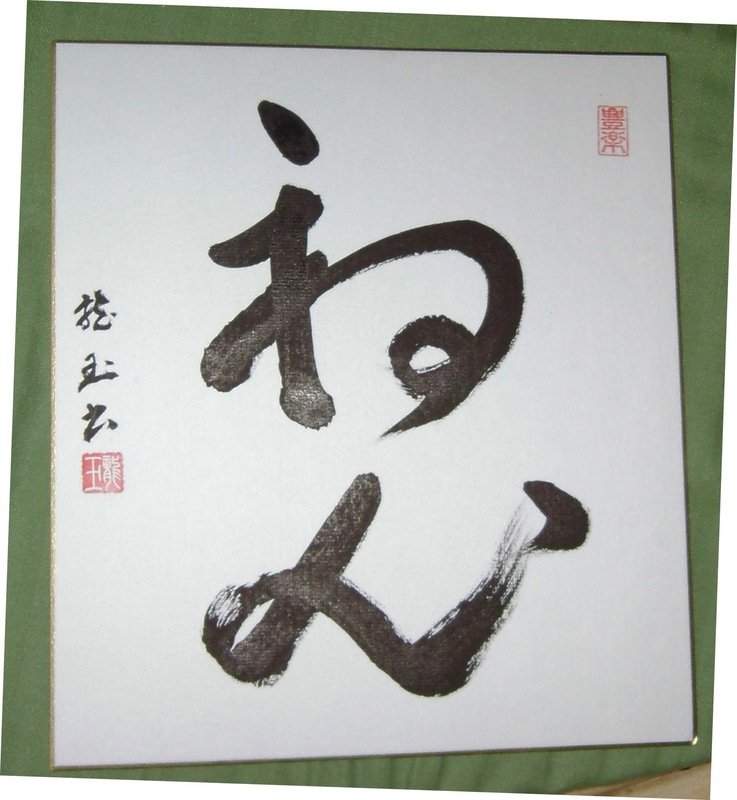 My display Sensei explained that the calligraphy does not compete with the tree, compared to the formal strong brush strokes associated with Block Print style writing. The writing of the scroll says Ka Chou Fuu Getsu. It is four character idiom for the beauties of Nature. The characters are 花 flower, 鳥 bird, 風 wind, and 月 moon. A deeper explanation of the particular design of this scroll is provided here. I love the earth tone cloth selected, and the Gold on Green Ichimonji is a perfect complement to the work. 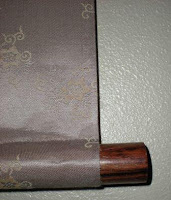 This was the first customer to have a Kokutan (Ebony) Jikusaki onto the scroll, and it sets it apart as very beautiful. There is one point in particular with the pairing that I love is the final brush stroke of the character moon, seems to complement the branching and trunk of the tree…It makes me feel good to know that some of my large scrolls are now coming to be used with these formal toko no ma bonsai displays. This is another painting by Mariusz Szmerdt. 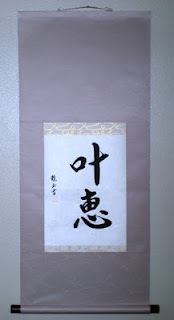 It is for sale and if you want to purchase the wallscroll contact to sales@customjapanesecalligraphy.com. It I kept this in the Maru Hyougu style because I wanted to keep it simple. I used a Navy silk with an Aka Renga (Brick Red) Ichimonji with a large Karakusa (arabesque). In contrast to the other scroll, I kept the Kakehimo and the Jikusaki dark to be almost invisible. The Kakehimo is the kogecha color, and the Jikusaki is the Kokutan (ebony) style. I liked the scroll, except that there was a little Uki in the Ichimonji that I was not happy with. This painting was done by the very talented Polish Artist Mariusz Szmerdt. It is for sale. For sale inquiries please contact to sales@customjapanesecalligraphy.com. I requested him to complete some American themed paintings because several bonsai artists had written or spoken to me about not being able to understand the intricacies of Japanese displays, and a desire to have pieces that provide an American flair. In designing this scroll, I thought it would be best to keep it very simple. The Fukuro Hyougu style fit this bill. The tan/dust color of the cloth was used to represent the desert sands of the southwest. I used the grey suji (Suji are the thin strips of cloth) and Nezumi (Mouse Colored) Kakehimo to be complementary to the clouds in the picture. The Dark Blue Jikusaki are ceramic and were used to represent the dark night time sky. This scroll is available for purchase. I will sell it for $30.00 plus shipping. This Aikidou scroll is written in the Sousho style which is a free hand full cursive writing. It is not a big scroll, but the cloth alone is worth the cost of the scroll. This is a Pure Silk, and has a very beautiful pattern. This kakejiku was made for an Aikidou Sensei in the South. The scroll is quite small, and is written in the Kaisho, or block print style. The scroll is on a light green cotton, and turned out quite nicely. It is written by Yoshimi Yamada Maples. If you would like a custom Aikidou Scroll made for your dojo, please contact to sales@customjapanesecalligraphy.com. Also look at these links for premade Aikidou Scrolls for sale. This shikishi board was ordered by a customer as a return order. He is having it made for a student that recently passed his shodan (black belt) examination. When I explained that there is a double meaning to the word this was the comment. What you explained was exactly why I wanted this work for the new shodan. I wanted something that would mean something now, and after their training progressed meant something new to them later. Bonsai artists would have had a field day if this was the scroll that I originally wanted to display in the Toko no Ma display at the Toko Kazari competition at the Clark Center for Japanese Art and Culture.....but as it is that scroll was still not traditional enough. Because most Westerners can not read Kanji to a high level of proficiency, one of my philosophies of scroll frame design is to convey a message through the cloth consistent with the meaning of the word or phrase. In this case, I took the Dragon cloth pattern that is very clearly visible, and put it into the meaning of the transformation of the Koi into a Dragon. This scroll is in a simple Fukuro Hyougu style, because I wanted the viewer to focus solely on the lettering and visually see the transformation into the dragon. I used a larger jikubou and jikusaki for this scroll to provide a better view of the dragon. This small wallscroll is for sale. Please contact to sales@customjapanesecalligraphy.com for pricing. This scroll is in a Sandan Hyougu style. However, the jikubou is a 5 bun wood piece with no jikusaki. The hassou is a hard wrapped paper. I made this scroll with the small left over pieces of cloth that I did not want to discard. It is written by Yoshimi Yamada Maples and is in the Gyousho or semi cursive style, with a non-traditional flair. It is only 10 inches long by 7 inches wide. This scroll is no longer available for sale and immediate shipment. For inquiries to have a custom Enso scroll made please contact to sales@customjapanesecalligraphy.com. This scroll was made with the remainder of cloth used for other scrolls. That is the reason for the small size. There can be good reason to also have scrolls made smaller than usual. I like the flow of the light to darker to darkest contrast of the scroll. The plastic ivory color jikusaki provides a good feel to the scroll. This scroll is in the Maru Hyougu style, which is the basic Japanese style of framing the artwork. It is simple, and not overly complex. The gold in this cloth really pops to the viewer against the grey background. I love this Kinran, it provides an excellent flowing feel like the calligraphy brush circle. The brushwork was done by Ryugyoku, Yoshimi Maples.